It doesn’t matter what subject you teach – there is something there for you. I like it because it is a counter to the compartmentalisation of knowledge which is so endemic in secondary schools. So what should I recommend? I was going to try to list a few, but that would actually go against the spirit of TED; there is no ‘best’. Simply go to the home page and just browse through a category that interests you. It won’t be long before you get pulled out of your comfort zone. But keep it a secret; if the powers-that-be find out how incredible it is they may just have to block it. 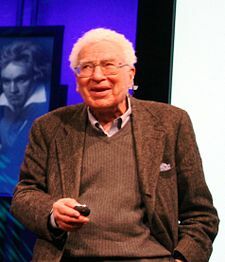 Murray Gell-Mann, the Nobel prize-winning scientist who ‘discovered’ quarks and took the word from Joyce’s Finnegans Wake, thought that Physics at high school was “the dullest course I had ever taken”, and he only applied to study physics at university “to please my father”. Taken from; When we were kids: how a child becomes a scientist. I wonder how his physics teacher felt when he read that? The Large Hadron Collider (LHC) in CERN will be the world’s largest particle accelerator when its construction is completed sometime this Summer. It’s a pretty big deal if you are a particle physicist, and even if not you are still likely to be bombarded with the news when it is finally switched on. ‘Tips’ aren’t really a good idea for the Leaving Cert Physics paper, but if I had to guess I would suggest that something in this area is going to make an appearance on the Particle Physics question this year. To find out why this is such a big deal you could do worse than watch Brian Cox talking at TED this year. The Higgs particle isn’t on the syllabus but it should be. It’s probably the Holy Grail of Particle Physics. It aims to explain why particles have mass, which isn’t as silly as it sounds (apparently). ‘Course I could be completely wrong.